Use tools like Git, Composer or vim remotely. Your files live in /var/www/html. By far the easiest way is to use the web terminal. It works great for remote-only operations; for uploading and downloading files, you'll still want to use a local SSH connection. SSH clients are available in all major operating systems, including Windows since April 2018 Update. On older versions of Windows, you can use PuTTY or Git Bash from Git for Windows. You can click any of the information to copy it to clipboard, or use the Open in SSH client button to launch an app handling the ssh:// protocol, e.g., iTerm. Pay special attention to the port as it is unique for each site and environment. 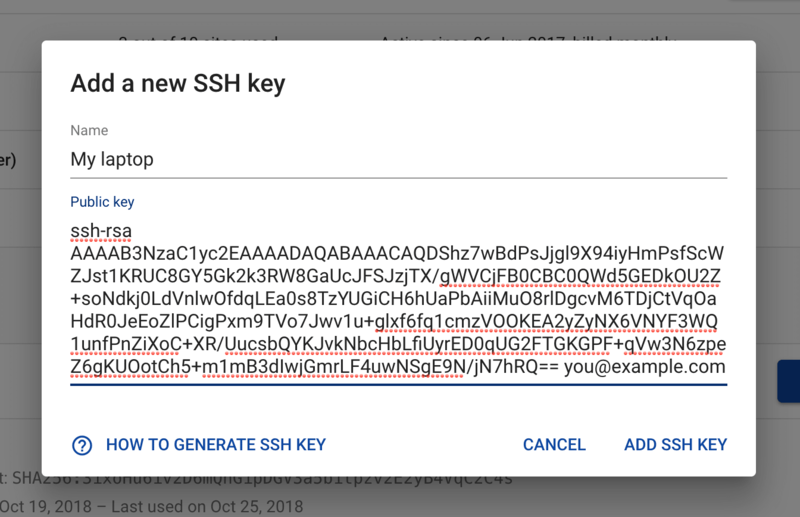 SSH keys are a secure and convenient way to authenticate to SSH and SFTP. You manage your SSH keys in your account. It's also possible to authenticate with a password, the SSH client will prompt for it if it cannot authenticate with a key. rsync is a better way to upload and download files. Again, pay special attention to the port as it is unique for each site and environment. See Uploading files via SFTP for more info. Please see the Database section to learn more.